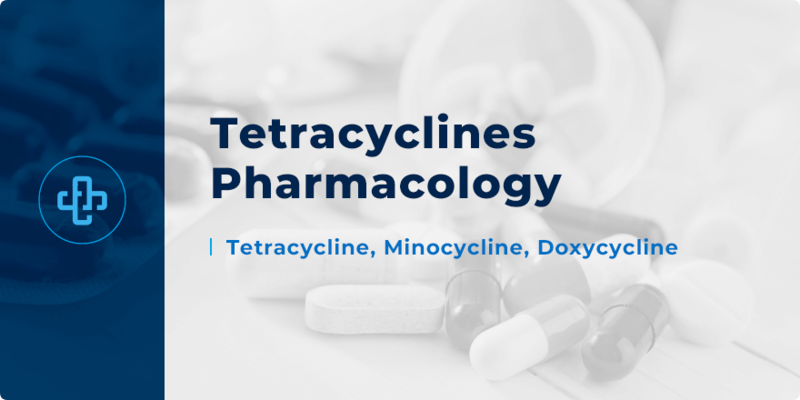 Tetracyclines Pharmacology | All the Facts in One Place! Tetracyclines are among the most widely prescribed antibacterial agents. They are used to treat a wide variety of infections – both minor and serious. Tetracyclines have been around since the 1940s. However, their efficacy has gone into decline, not least due to the ever-present threat of resistance. Nonetheless, they remain a commonly prescribed antibacterial group for a wide variety of infections. Other infections such as Chlamydia, typhoid, anthrax and Lyme disease. Before we review the therapeutic considerations of tetracyclines, let’s take a few minutes to review their pharmacology – how tetracyclines exert their therapeutic impact. Tetracyclines are protein synthesis inhibitors. More specifically, tetracyclines prevent the binding of aminoacyl-tRNA to the mRNA-ribosome complex. This prevents both the formation and elongation of the polypeptide chain – a process they inhibit at the 30S ribosomal subunit. This process is bacteriostatic in effect – meaning that tetracyclines prevent further bacterial growth. This helps the body overcome the bacterial infection and kill it off. Most resistance occurs through the formation of the efflux pump. With the efflux pump, bacteria can “pump” out tetracyclines from the cell. Enzymatic inactivation also occurs, though this is a much rarer cause of resistance. A third method, namely ribosomal protection, can also take place – where bacteria prevent tetracyclines from binding to the bacterial ribosomal subunit. Tetracycline antibacterials are associated with their own range of potential side effects. Other side effects include esophageal irritation and intracranial hypertension. Fanconi syndrome is a potential consequence of taking expired tetracyclines; a syndrome characterised by improper reabsorption from the proximal tubules of the kidney. Hypersensitivity reactions are rare, occurring in approx. 1 percent of patients. That tetracyclines, due to the risk of discoloration, are contraindicated in pregnant or lactating women and in children with developing teeth. Bone growth may also be affected. That taking tetracyclines with certain ions – such as zinc, calcium, aluminium and magnesium – can chelate and render useless the therapeutic function of these medicines. Tetracyclines should not be administered alongside dietary supplements or antacids that contain these ions. That tetracyclines may worsen the symptoms in patients with myasthenia gravis. That by killing colonic gut flora which otherwise produces vitamin K, tetracyclines enhance the anticoagulant effect of warfarin. That tetracyclines, in some patients, can cause steatosis and liver toxicity. Monitoring may be required with long-term use – for example, in patients on high dose tetracycline treatment for severe acne. Though tetracycline resistance has increased in recent years, they remain an important drug class for the treatment of a wide variety of infections. They also remain an important choice in malaria prophylaxis, too. Want to learn more about tetracyclines pharmacology? Register with PharmaFactz today to receive instant access to all the resources you need. In the meantime, take a few seconds to join our pharmacy blog newsletter (above) to receive all the latest facts direct to your email!